Onion is an extremely nutritious food that is rich in carbohydrates, it is rather low in fats and proteins. It is widely used in the kitchen, often used as a natural remedy in traditional medicine, especially effective against respiratory diseases such as bronchitis, because it strengthens the body and prevents further loss of immunity. We can say that it is a versatile vegetable. It is desirable to consume it raw in the form as a supplement to our favourite salads, but it certainly should be cooked and served. It is one of the healthiest vegetable crops, because it is known to revitalize the body, and has tremendous healing power. This unique natural shield, will defend you from many infections and germs that surround you in your everyday life. We encourage you to stay with us, because we will hereinafter explain for what is onion good for as a medicine and we have prepared a more excellent local recipes intended for good health. Onion Latin name Allium is part of the family of vegetables and herbs that include garlic and leeks. Allium has been grown for centuries, not only because of its characteristic bitter taste, but also because of the medicinal properties in its possession. It can vary in shape, size, colour and taste. The most common types are red, yellow and white. Aromas can range from sweet and juicy to extremely spicy varieties. Have you wondered why do you cry when you cut onions? This is because it contains sulphur compounds that gives it its distinctive peppery taste. It has a large amount of vitamin B, A, C and E and revitalizes our body and improves our health in general. The presence of vitamin C seems to act as a natural shield in defence of our organism. Onions originated from Asia and the Middle East. The ancient Egyptians appreciated this healthy vegetable, but even paid workers with it to build pyramids, it is known that it was placed in the tombs of the pharaohs. In the sixth century, it has been used in India as a medicine, in America it was brought by none other than C. Columbus. Since ancient times it was used for various diseases. It has a small number of calories, and is especially rich in precious mineral salts. It contains allyl propyl disulphide, and it is very rich in chromium, a mineral that helps the cells to respond to insulin, vitamin C as already mentioned, and a number of flavonoids, of which the most present is quercetin. The more you consume onion, the lower the levels of glucose in blood. Clinical studies that were conducted among diabetics showed that chromium lowers blood glucose and improves glucose tolerance, lowers insulin, and triglycerides and total cholesterol, while increasing good cholesterol. You must be aware that the level of chromium decreases if you consume products made of white flour and refined sugars, and if you do not move enough. Consuming just one cup of fresh onion juice, you enter into your body 20 percent of the recommended daily dose of chromium. If you regularly use the onion, two or more times a week, you can reduce considerably predisposition risk of getting colon cancer. Because it contains a number of flavonoids, of which quercetin showed an excellent results in stopping tumour development in animals and protects colon cells from damage due to the effects of carcinogenic substances. When you use it for cooking meat it can help reduce the quantity of carcinogens that form when you fry it at high temperatures. Yes, onion protects against many types of cancer. 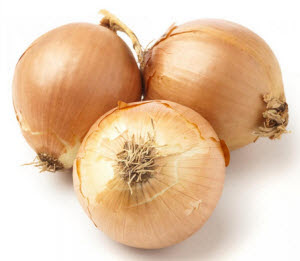 Specifically, participants who ate the most onion decreased the risk by 84 percent of getting a cancers of the oral cavity and pharynx, and even by 88 percent reduction when it comes to oesophageal cancer, 56 percent of colon cancer, and 25 percent of breast cancer. Ingredient found in onion, inhibits the activity of osteoclast ie. cells that affect the brittleness of the bones. The juice of onion has a particularly beneficial effect on women who are at increased risk of getting osteoporosis during menopause. Onion as a medicine is used to treat digestive problems, including loss of appetite, upset stomach and gallbladder disorders, for the treatment of heart problems and blood vessels, with intense chest pain (angina), high blood pressure, it is good with atherosclerosis. It is also used as a tea for cough, to treat inflammation of the mouth and throat, bronchitis, asthma and diabetes. Some people use it against insect bites by applying it directly to the skin. It is very effective for wounds, burns, warts and bruises. The cure for rheumatism: It is necessary that in one litre of water, you boil for about 15 minutes three paddy onions. After removing from the heat, the resulting liquid is required to be distributed into two equal parts and one part of the drink you drink in the morning on an empty stomach, and the other part at bedtime. There is another option to reduce the pain caused by rheumatism, and that is to make a tincture of 90 g of crushed onion with 100 ml of medicine alcohol. Tincture must sit for about 12 hours. Three times a day in a small cup of water, add about 10 to 15 drops of tincture and drink all at once. You will quickly feel relieved and reduction of pain will be immediate. Against diarrhoea: there are various ways to treat diarrhoea, and onion is one of them. To alleviate this uncomfortable condition in 1 litre of water add 15 grams of onion shell and let it boil for about 10 minutes. The resultant juice needs to be strained and drink 1 cup in the morning on an empty stomach and one at bedtime. Onion as a medicine for prostate: prepare a tincture by squeezing 40 grams of fresh onion, and the resulting juice mix with 120 ml of medicinal alcohol of 80 degrees. Shake well and drink one tablespoon of this medicinal beverage in a glass of water before each meal. Use this treatment for 10 days, we recommend text inflammation of the prostate. For liver disease: daily use of onion soup. For skin: mash one onion and gently rub it on your skin to make your skin soft and smooth. You can feel free to apply it to the face. It is very effective in eliminating the stains on the skin. For the treatment of depression and nervous tension: use onion juice, which you mix with honey and drink 3-5 teaspoons a day. To cure migraine: rub the back of the neck with the mixture of onion and lemon. Lowering high temperatures: Put the onion on the soles of the feet as a compress. Put 1 kg of chopped onion and let it stand for 60 minutes. Tea for urination: in one litre of water put 2 onions and boil them, add one small celery and 200g of parsley. Give everything a good wash before everything and chop it into small pieces. The resultant mixture divide into 4 equal doses and drink during the day at regular intervals. Most people are sceptical when it comes to the use of onions for hair growth, although scientific studies have long shown its benefits. That onion is good for the hair it has been proven many times, especially when it comes to its healthy juice. Regular treatment slows down and reduces hair loss, while the long-term use stimulates the growth of new hair. For other problems with hair such as dandruff, seborrhoea dermatitis, fungal infections, etc., visible improvement were made after only a few weeks of use. It was also found that the onion is effective in preventing the appearance of grey hair prematurely. It is very rich in sulphur, and when used alone or combined with other preparations, can improve blood circulation to the scalp. Sulphur also improves the production of collagen, which is indispensable for new hair growth. The sulphur content in the juice has excellent antibacterial properties and prevents the growth of fungi and bacteria on the scalp, which greatly reduces the chances of losing hair due to infection. The onion juice increases strength and prevents thinning and breaking of hair. Cut onion into thin slices and place in a bowl. Pour three tablespoons of sugar over it and let it stand all night. The next day on an empty stomach drink the juice that onion released. Repeat this process until the cough is gone. Against flu: in a glass of hot water, add the juice of one squeezed lemon, a tablespoon of honey and 2 tablespoons of onion juice. It is necessary to drink 5-6 times a day. For the treatment of asthma: You will feel a great relief if you consume fried onions every morning and evening. Onions against hoarseness: Mix 20 grams of onions and 250 ml of milk and leave it for 10 minutes on the stove to warm up well. Drink two decilitres in the morning and at bedtime. We recommend that you rinse the throat two or three times a day with this phenomenal beverage. Combine ¼ cup of onion juice with one tablespoon of honey. Apply the mixture on the hair. Leave it to rest for at least 30 minutes, you can cover it with a shower cap and leave it overnight. In the morning, rinse the mixture. This is a proven natural treatment, so for tangible and visible results you will have to be a little more patient, but believe that the persistence at the end is definitely worth it. Use it like this every day, or a minimum of 3 times a week and the difference should be noticed two months later. If the smell is unbearable you can use the other method to prevent hair loss and to enhance its new growth. Finely chop an onion of medium size and plunge it into a full glass of rum and let it sit throughout the night. The next day, strain the mixture to remove the pieces of onion. Use this mixture to massage the scalp or you can rinse your hair after washing. We hope that you found out how much onion as a medicine is good for you and how much useful and beneficial it can be for our health.